A SEVEN-YEAR old Knaphill boy has just set off for Athens in his first international event to represent the UK at a major international martial arts competition that finishes this weekend. Jay Coote is competing in the 2017 Amateur Members Association World Championships organised by the International Sport Kickboxing Association. He is a pupil of The Hermitage School in St Johns, and an accomplished gymnast and martial arts athlete with an impressive string of national awards and trophies over. Jay, who is being accompanied by his father, Dean, is taking part in two individual display categories: open-handed fighting without weapons, and with weapons using bo-staff and nunchucks. He will be competing in the 8-12 and 13-17 age brackets because no formal categories exist for a seven-year-old. “From a very young age he always showed extreme co-ordination and concentration,” his mother, Gemma, told the News & Mail. “He loved doing anything to the extreme. He rode his bike without stabilisers before he was three, was waterboarding down the Quays in Mytchett at two and snowboarding by himself down a mountain in France at three. “Then he joined Woking Gymnastics Club’s Kinder Gym at just nine months. He progressed through to the recreational classes where at five he was picked for the Boys Squad. This was coached by Simon Elliott who also coaches three times under 15’s gymnastic champion Jamie Lewis. “Jay joined Hands Down Martial Arts as a ‘little dragon’ at four. 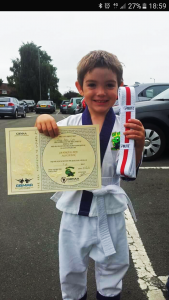 At six, he was asked to join the Elite Team and started competing nationally last year when he was spotted and selected for sponsorship by leading US martial arts organisation Hyper MA who arrange events and supply martial arts weapons and clothing”. In February this year Jay was asked to send a video of his Martial Arts forms into a panel of judges to be assessed. “He was selected along with his friend, Isaac Shalgosky, to go to Athens to represent England for the IKSA World Championships,” Gemma said. Jay told the News & Mail that he was prompted to take up the sport by his dad and uncle Liam who used to do kickboxing and gymnastics. “I tried it and found that I liked it and could be good at it. I like competitions and the whole idea of competing against other people,” Jay said. The lad said that when he leaves school he wants to be a stuntman like his Uncle Liam. “He was in a number of films, including Star Wars and Jurassic Park“.